During my dad's job with Eagle Picher, he traveled to various states and countries. There was a time that I think he traveled at least once a month. One place he visited was the EP plant in Socorro, New Mexico. It was there that he had his first taste of real Mexican food. Unfortunately at the time, Joplin didn't have much in the way of Mexican restaurants, so Dad decided he needed to just try making his favorite dish himself - enchiladas. Over the years it was quite the event to have these enchiladas! Dad would spend hours cutting up vegetables and simmering the sauce. At some point I became his regular helper and while he fried the tortillas, I would assemble the enchiladas. 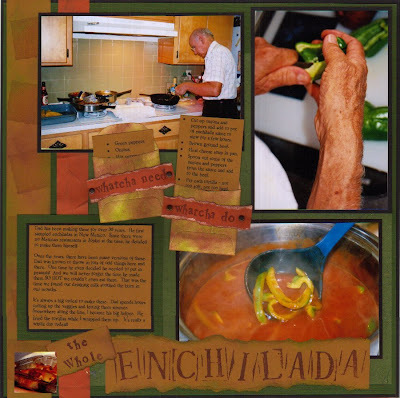 There have been many versions of Dad's enchiladas because he always would throw in different ingredients. Once it was peanuts! And one time he made them so HOT we could not even eat them. October 10 is the anniversary of my dad's death. It's been 7 years now, and we all still miss this amazing man. So, each October 10, I honor him by making Mexican food or we go out for it. I don't always make enchiladas, and I don't always make them his way (since it takes so long). But I enjoy reminiscing about all the great times we had over this special meal. And fortunately I am a scrapbooker and knew to capture this event with photos and a layout, one of the last times he made them.